Although I'm enjoying the writing, something about this book isn't quite grabbing me - maybe I'm just not in the mood for at at the moment. I will put it aside for now and return to it later. This book is a bit bonkers. 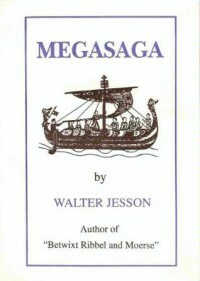 It purports to give the origins of the Rimmer family and by way of doing so draws in the lost tribes of Israel, Vikings, King Arthur, Robin Hood, the creation of the Russian nation, the discovery of America and various other historical milestones. All very entertaining, if implausible.When it turns to local history and the author's reminiscences of his childhood in centre of "Rimmerdom", Southport, Lancashire, then it is a very good and interesting narrative. Lots of old photos add to the charm of this idiosyncratic little volume. The story is a workmanlike adaptation for children, but the illustrations by Thomas Mackenzie are really rather fine, hence the 4-star rating. I've finished the first book in this volume, The Thirty-Nine Steps, so my rating is currently based on that one novel.Well written and easy to read. The first person narrative gets you into Hannay's adventures very quickly. Cracking stuff! I had intended never to own a Terry Pratchett book for the very unreasonable reason that whenever he did a book signing at Forbidden Planet at its former London location on New Oxford Street, there was a massive queue of pasty-faced, slightly overweight men in long leather coats and fedora hats blocking my way into the shop. They disrupted my comic-buying mission and ruined my plan to browse the lower-floor book section, it being off limits to all but Pratchett acolytes.Annoying! And it felt like an unpredictable, occasionally-repeated personal attack upon me by Terry Prachett (well, I did say it was an unreasonable reason). So, I've never read him - but my wife and son have, and they rather disloyally enjoyed his books, which is why I entered a Goodreads Giveaway, which I surprisingly (and ironically) won and so own this one.I suppose I might eventually read it myself, and I might possibly, grudgingly, enjoy it. 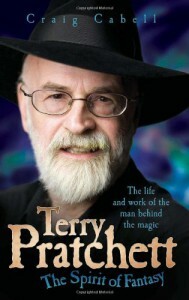 But I've still got my eye on you, Mr Pratchett! 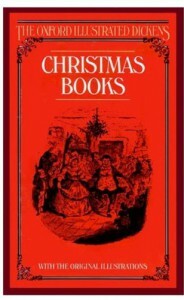 The Christmas Books, while not always being set during the festive season, each exemplify some aspect of the spirit of charity and "goodwill to all men" that Dickens felt so important in the celebration of Christ's birth, and which he did so much to forge into what is now seen as "a traditional Christmas".The Battle of Life: Self-sacrifice and familial love are the messages here. Some wonderfully drawn characters in Clemency Newcome (servant) and Messrs. Snitchey and Craggs (lawyers). Expectations are nicely confounded in this one. 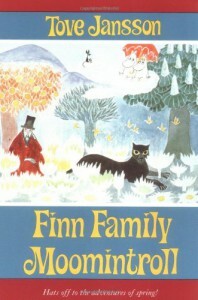 I remember Moomintroll from TV adaptations and Jackanory readings from when I was a child, but I've never read any of Jansson's Moomin stories until now. I liked it!The story has its interesting points, but what makes this book for me are Jansson's illustrations - very strange, phantasmagorical and other-worldly.The slim story is a series of episodes in the journey made by Moomintroll and Moominmamma, searching for the missing Moominpappa who, for no good reason that I can discern, has left his family to go a-wandering with the rather creepy Hattifatners. The "little creature" they meet and adopt (named Sniff in later books) is reminiscent of Piglet, Winnie-the-Pooh's friend, being easily frightened and rather timorous through most of the story. Tulippa is a rather mysterious "flower-fairy", who joins their company for a while, before somewhat capriciously deciding to shack up with a lighthouse keeper (if it was a lighthouse). Then there's the old man who has created a world made out of chocolates (Fazer brand), sweets and lemonade, prefiguring Dahl's Willy Wonka, though I'm uncertain as to any direct connection.A great story for children, and I'm sorry that I didn't come to these books in time to read them to mine - I think I've a while to wait for grandchildren, but when they arrive Moomintroll will be waiting for them! 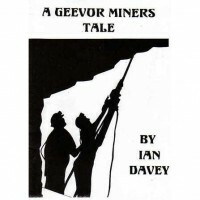 A short book (pamphlet, really) about life working in a Cornish tin mine.The author was a miner at Geevor tin mine and, when we visited it during a family holiday in 2003, he was working as a guide in what had become a heritage and visitors' centre. Reading his story brings back memories of walking through the derelict offices, abandoned changing rooms and dimly-lit tunnels, silent since that the miners stopped working in 1990. 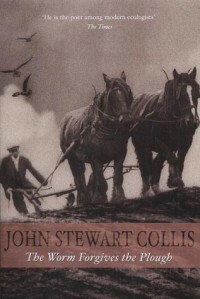 It was both impressive and depressing - a hard but dignified way of life that had become history (at least in that part of the world), but was still a part of living memory.Mining is a kind of work I can only imagine, but the hard graft and danger it entails seems to instil a fierce pride in the men that do it. Geevor seemed haunted by their demise. One February day in 1990 managers, many of whom the men had never seen before, told them the mine was closing immediately. The miners were instructed at 07:15 in the morning to have their personal property cleared from their lockers by 09:30, anything remaining at that time to be burnt. A shocking and dehumanizing way to treat men who risked their lives each time they went underground.When we left Geevor towards the end of its opening time, I was feeling rather melancholy, filled with a sense of decay and dissolution, doubtful to be the effect the County Council wanted for its visitors. Still, I had the consolation of driving away towards the westering Cornish sun, shining over the sea and turning the cliffs red, and later cheered up by bags of chips with the family on the sea-front at Sennan Cove. It's a long time since I sat down with a book and read it from cover-to-cover, but (apart from a necessary overnight sleep) that's what I did with The Summer Book.It's a book of small incidents and and close intimacies between a young girl, Sophia, and her grandmother, who spend their summer months together on a tiny island in the Gulf of Finland. Even when the occasional large-scale event intrudes, such as the storm that Sophia prays for and then regrets, the focus is on the interplay between the child and her grandmother.I like it that both characters are given equal voice, the point of view flowing gently from one to the other. Papa is with them, a loved and often worried-over figure, but he's usually "off-stage".It's clear that the events of several summers are narrated in the course of the story, but there is little to indicate any growth in the relationship between the two - their attitudes towards each other are basically the same at the end as at the beginning: the child alternately loving and hating her grandmother and taking her presence for granted - she had never given thought to the fact that Grandmother must once have been married and that there was a Grandfather at some time in the past; Grandmother nurturing and cherishing the child, while finding her demands a nuisance and throwing petulant fits as unreasonable as those of the child's. The constancy of their relationship is a reflection of the endless summer days of the high latitudes. 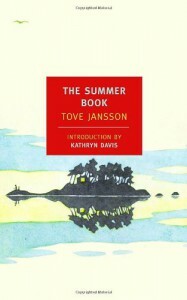 Ending the book with Sophia still a child, unchanged by adolescence and unaware of the minds and needs of others, Jansson creates something timeless. Dark Agnes is a rare thing in the writings of Robert E. Howard: a female protagonist. As she says herself, "I drink, fight, and live like a man," and so it is that, once having killed the man she is being forced to marry, she is little different from a myriad other of Howard's fighting heroes. Which isn't necessarily a bad thing, but it is a thing. 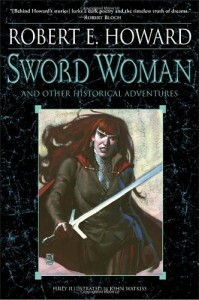 The only real difference is in the attitudes of the men she faces in combat, who inevitably underestimate her strength and skill with a sword, with equally inevitable consequences.The three stories featuring Agnes are grounded in medieval France, rather than a fantasy world, and the first two are historical adventure stories without any fantasy or supernatural elements. They swing along with the pace and brutality for which Howard is famous, with some nice touches of intrigue. 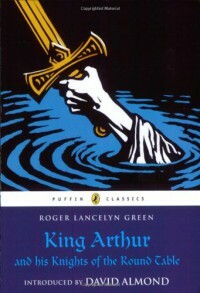 The third Agnes story was edited together from two unfinished versions and has a supernatural twist, which I felt was not needed but neither did it detract from my enjoyment.Perhaps, had Howard sold the stories (they were published posthumously) and had some success with them, Agnes would have developed into a more distinct character. As it is, they are good Howardian tales with enough of a different slant to make them enjoyably memorable.The other two stories in this collection are unfinished fragments featuring two of Howard's more usual characterisations: (male) barbarian super-warriors.Donn Othna is an Irish prince exiled, captured by Vikings and lost at sea, who washes up in India, of all places. This was apparently to be the start of a novel about his battles and intrigues (actually, Howard writes political intrigues rather well) with the various power-blocs of the decadent city-state in which he finds himself. The story ends quite abruptly after the description of a fairly brutal hand-to-hand between Donn Othna and a strangler-assassin.The final story, featuring exiled Irish prince Turlogh O'Brien, is framed as a flashback within a flashback, a nice recession that adds an interesting "Arabian Knights" quality to the tale. O'Brien is telling of his past wanderings amongst the steppe peoples east of the Caucasus. O'Brien is a grim fellow, even by Howard's standards, with a hatred for Vikings that is positively psychopathological (I'm not sure that's a proper word: he really, really doesn't like them, though). This story fragment ends even more abruptly than the last, which is a shame as it was just starting to roll.There's some debate amongst Howard fans as to whether his fragments are best published as they are - pristine and in Howard's words only - or completed and/or edited by other writers. Providing they are done well (I suppose that's obvious) and in sympathy with Howard's style, then I think I lean to the latter view. These are not works of great literature; they are well-crafted and exciting adventure stories that are great escapism. I want to know the end of the story, and if that means somebody else finishing them, so-be-it. 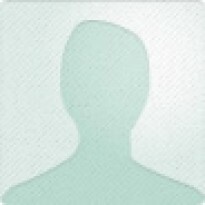 I do prefer to know which are the original words of the master and which the addition of the imitator, rather like those ancient, cracked murals you see in museums: the yellowing plaster and faded paintings filled in with new, white mortar, the amputated limbs of the long-dead people replaced with bright-painted prostheses. The completions add to the enjoyment while leaving you able to appreciate the skill of the original artist.So, a bit of a patchwork volume, but it all holds together rather well. 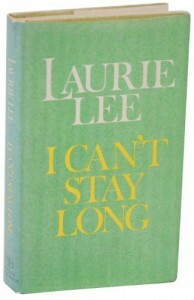 I dithered about my rating for I Can't Stay Long. It's a collection of short articles, essays and memoir that Lee put together from the flotsam and jetsam of papers on his study floor, and the result is somewhat uneven.Divided into three sections, Part One is a return to Slad, Lee's childhood home and the setting of his brilliant memoir, [b:Cider With Rosie|17454951|Cider With Rosie|Laurie Lee|http://d.gr-assets.com/books/1362230880s/17454951.jpg|1401317]. The pieces in this section are generally 4 and 5 star worthy, particularly A Drink with a Witch and First Love.Part Two has four pieces about abstracts: Love; Appetite; Charm and Paradise. Then, The Firstborn is Lee's hymn to his wife and their first child together (though not Lee's first child, as he had fathered another daughter with a different partner earlier in life). There are some nice passages in this, but somehow it didn't quite hit the mark with me. Although there is a lot of emotion, there is also curiously a certain distance and detachment. The best piece in this section is, by far, The Village that Lost its Children. This is an account of Lee's visit to the Welsh village of Aberfan, a year after the disaster that killed 144 people, 116 of them children. In fact, this is probably the stand-out piece in the whole book. Lee captures the quiet despair of those still struggling to come to terms with a wholly-preventable loss of life; the tensions between those bereaved and those whose families escaped the disaster (but not its consequences) and the problems caused by the huge sum of money donated to the village by well-wishers from all over the world.Part Three is a series of travel sketches of some of the places Lee had visited, from Beirut to Ireland to Mexico, and points in between, including an early flight on Concorde as part of a press contingent, an experience he found distinctly underwhelming!. This is the most uneven section of the book: I found some of these articles positively boring, which was most surprising to me as I've loved all of Lee's other writings. Still, there are some good ones in there too.Overall, then, I'd give this book 3.5 if I could, but as I can't I must round down rather than up. This is a book worth reading, and then worth keeping for the gems amongst the pebbles. 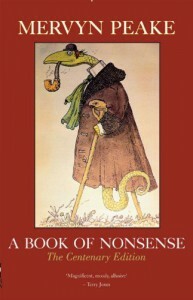 Why, when I already have two editions of this book (not to mention [b:Complete Nonsense|16447335|Complete Nonsense|Mervyn Peake|http://d.gr-assets.com/books/1356204730s/16447335.jpg|22637077]), do I need a third? Because:i) This has 12 previously unpublished Peake sketches on glossy paper;ii) I have Christmas and birthday book tokens nagging to be used;iii) I am cursed by the collecting bug.Perhaps, only maybe and possibly perhaps, I might divest myself of one of the other editions when I have my next library rationalization.In the meantime, I shall enjoy re-reading some of my favourite poems and will bask in the Technicolour glow of the illustration of Uncle Jake, who became a snake but never found it out and, as no one mentions it, one sees him still about. A nicely constructed book: sturdy and printed on good quality paper (take that, e-readers!). 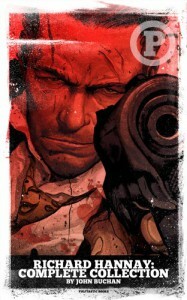 The illustrations match the stories excellently, for the most part, and in any event are well executed and atmospheric. 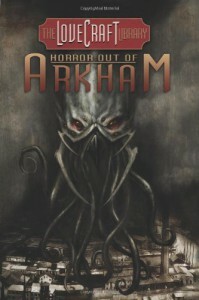 The stories are themed around Lovecraft's eerie New England town of Arkham, Massachusetts:Herbert West - Reanimator: One of my favourite Lovecraft stories, and a good opener to the collection. There is a certain degree of repetition, which I assume is due to it having been serialised in a pulp magazine, thus being furnished with regular recaps. That aside, it's a fine piece of ghoulish work. It also seems that Herbert West anticipated the use of embryonic stem cell therapy by about 80 years or so! Hopefully, nobody will be foolish enough to seek to recreate the research of the frightful Dr West! 5/5 stars.The Unnamable: The narrator of this short story is a writer whose friend criticises his overuse of words such as "unmentionable" and "unnamable" as a puerile device when referring to the horrors of which the author writes. I guess that Lovecraft may have had this criticism levelled at him, and here he pokes fun both at himself and his critic. Typically, this debate about the ineffability of cosmic horrors takes place in a graveyard, atop a shattered tomb, next to an ancient, abandoned house in the derelict outskirts of Arkham. Needless to say, indescribable horror pays a call.The story is accompanied by a great illustration, let down by its quite easily describable subject, so while it's a nice piece of art, it doesn't really complement the narrative. 4/5 stars. 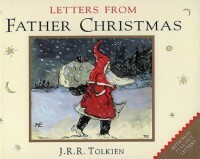 Reading this as an adult, what comes across most strongly is Tolkien's love and affection for his children (which is, of course, what one would expect of all parents for their children, but which sadly is not always so) and his delight in writing and drawing these little Christmas stories each year.Due to the very young age of his eldest son when the first letter was written in 1920, these early missives are very short, but in 1925 we get a longer message which introduces us to the North Polar Bear, who will feature every year thereafter, and a beautiful little painting of the NPB wrecking the North Pole itself, smashing Father Christmas's house, and a picture of the new house that he builds to replace it.The Letters were never intended for publication and it's a testament to Tolkien's remarkable skill at storytelling that simply collecting them together makes such a delightful book. The Letters do continue themes from one year to the next and the characters are likeable, funny and have their own personalities.The last couple of letters, addressed just to his youngest child, Priscilla, by this time, are quite poignant. It seems that she has been too busy to write to Father Christmas, but he has a good idea, anyway, of what she would like in her stocking (books, of course). In 1943, Father Christmas supposes that Priscilla will be hanging up her stocking just once more, and there was to me a feeling that, perhaps, she would not have missed Father Christmas's letters had they stopped a little earlier. Sometimes it's hard for parents to accept that their children have grown up. Nevertheless, Father Christmas assures Priscilla that he will never forget her, nor her brothers, and that when they have children of their own he may write again.A magical story to read with younger children, although I suspect that they might be wanting some letter from Father Christmas themselves afterwards, so be warned! Definitely a book for cat lovers only. 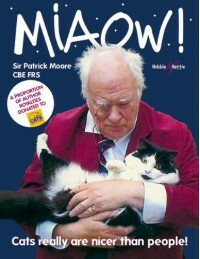 In fact, probably only a crazy cat-person will fully appreciate Patrick Moore's strong attachment to his feline companions. Even as a cat owner and ailurophile myself, I found the sentiment rather saccharine and mawkish.That said, Patrick Moore was a bona fide English eccentric and generally an all-round nice man who was held in genuine affection by his TV audience (including me) and those whose lives he touched more directly as inspiration, mentor and benefactor. Having lost his fiancée, who was serving as a nurse in the Second World War, when her ambulance was hit during a Nazi bombing raid, Moore never entered into another romantic relationship. 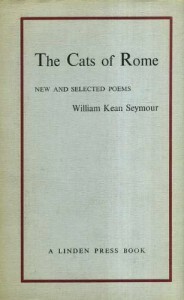 So, if he found comfort, consolation and an outlet for his tender feelings by doting on his cats, I can only be happy that they brought him joy and contentment.The book, then is rather slight in both content and page count, being a loose collection of personal anecdotes about Moore's last two pets, Jeannie and Ptolomy, padded out to 62 pages with a quantity of "family" cat photographs.Were it not for the affection in which I hold Mr Moore, I'd probably have given this 2 stars, but 3 it is in memoriam of a national institution and treasure whose like we are unlikely to see again.